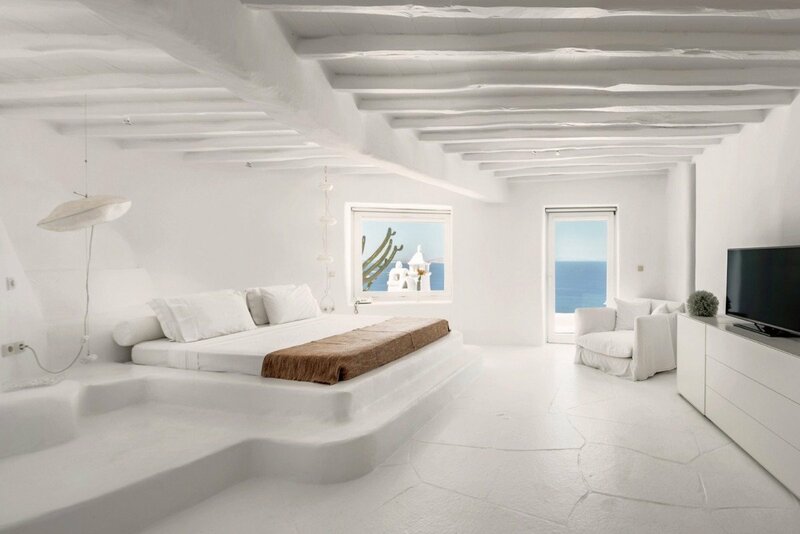 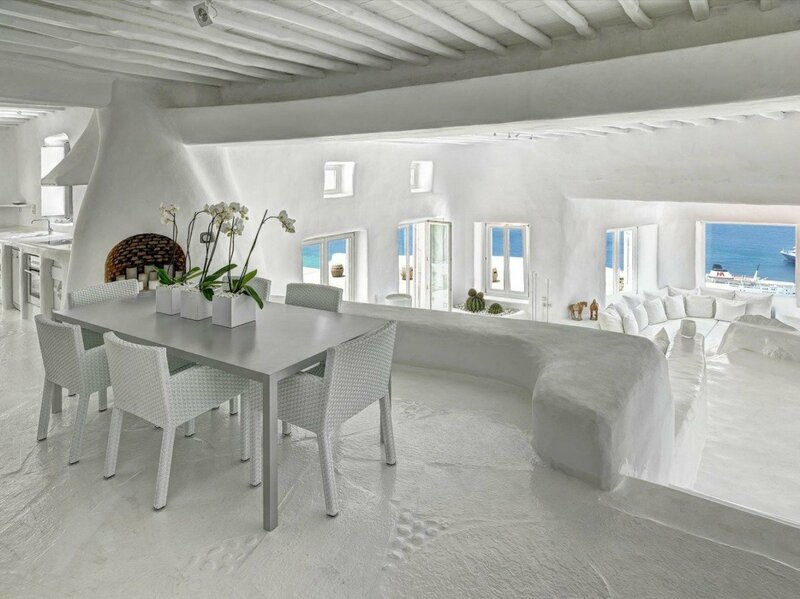 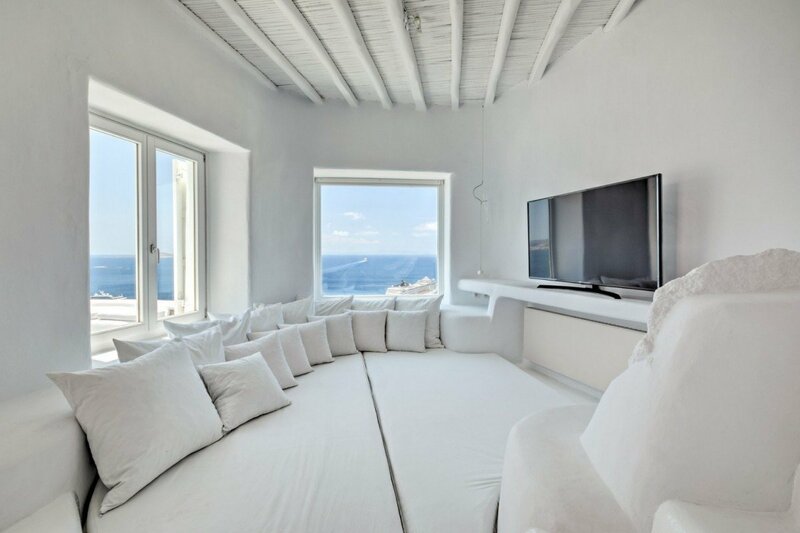 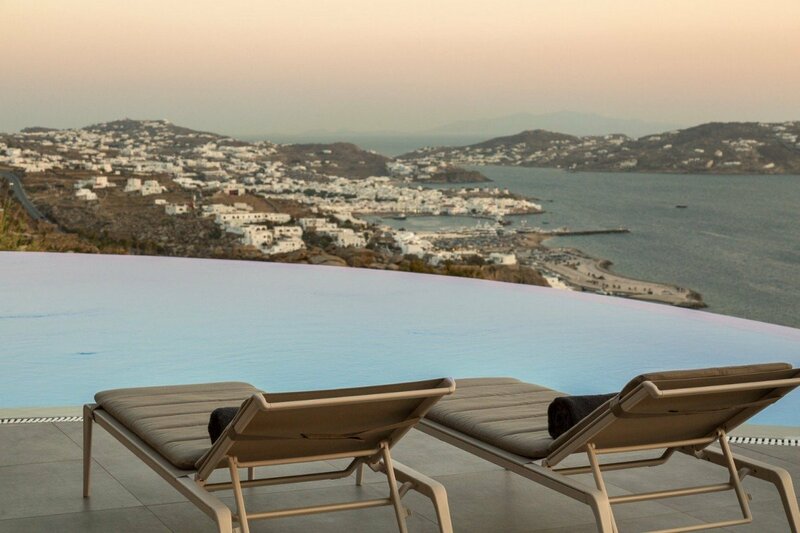 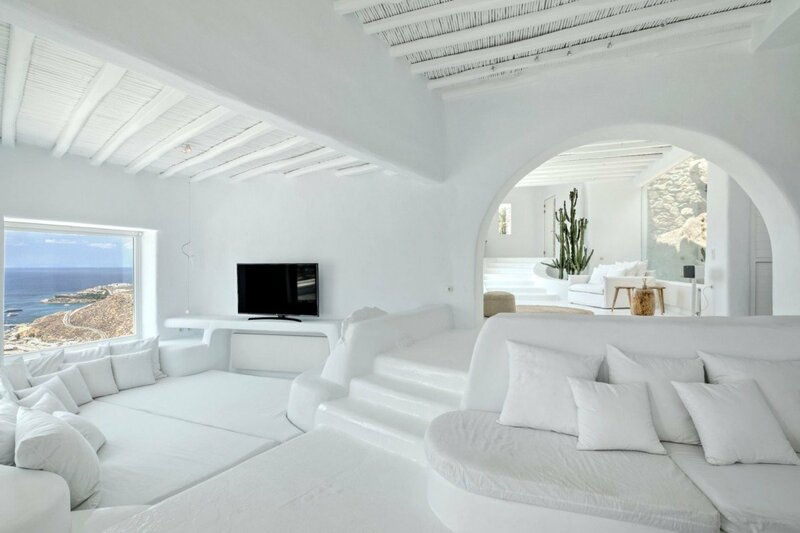 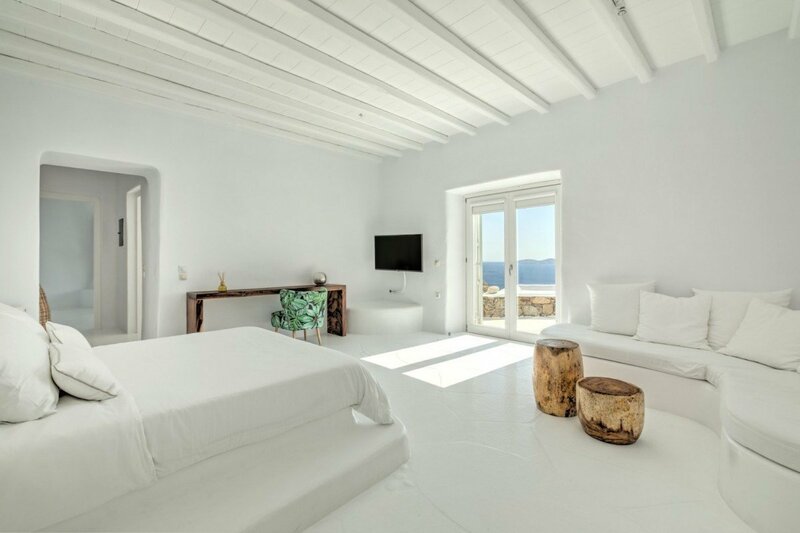 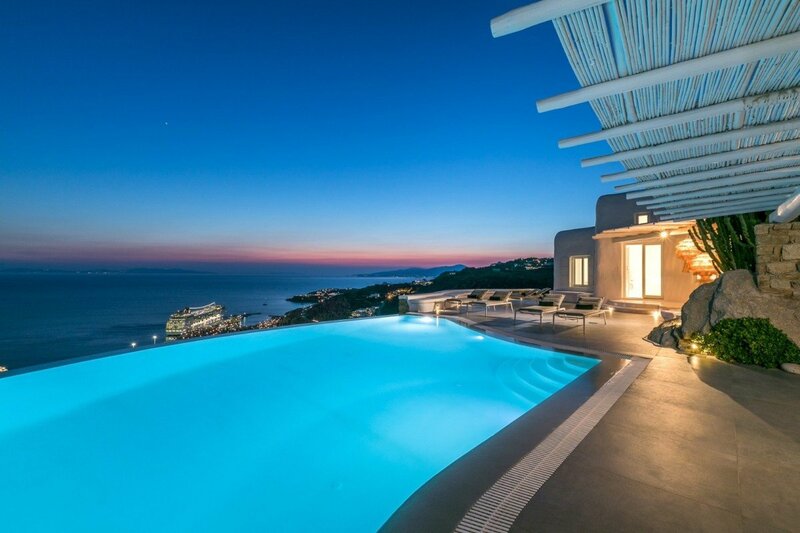 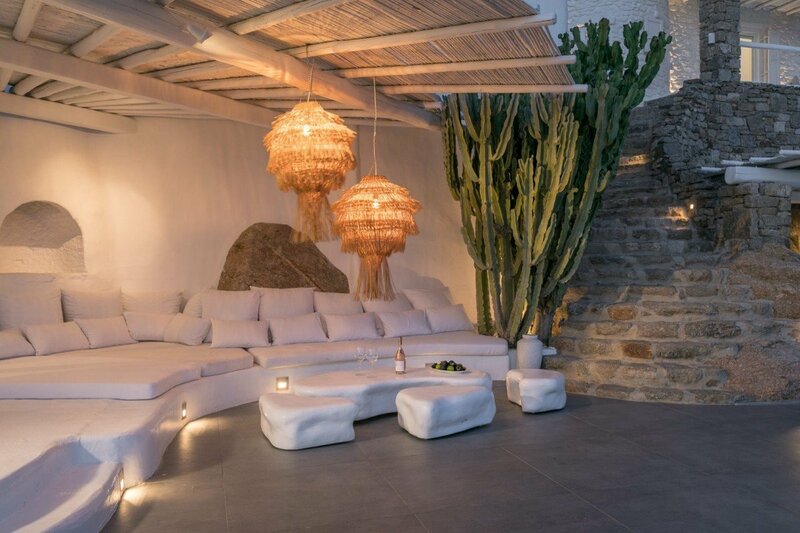 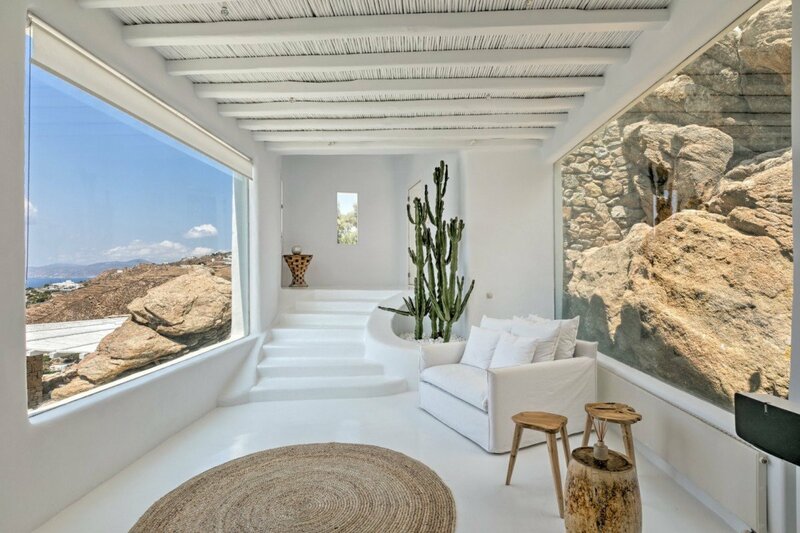 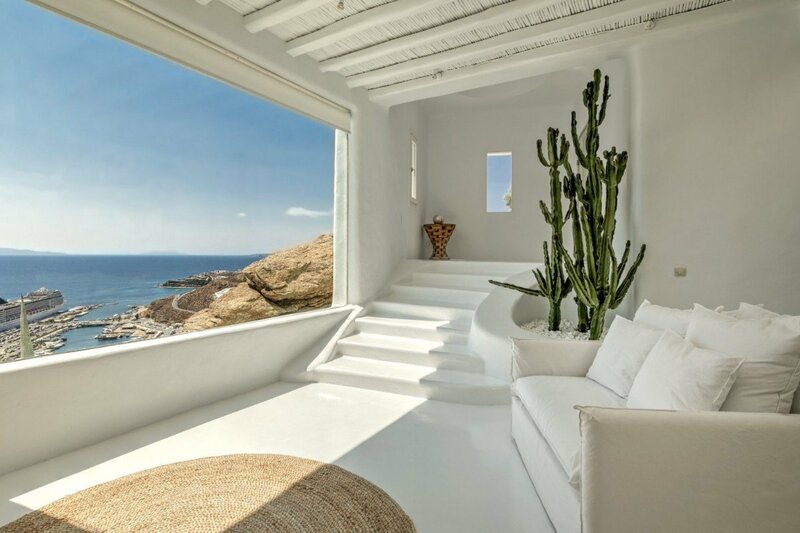 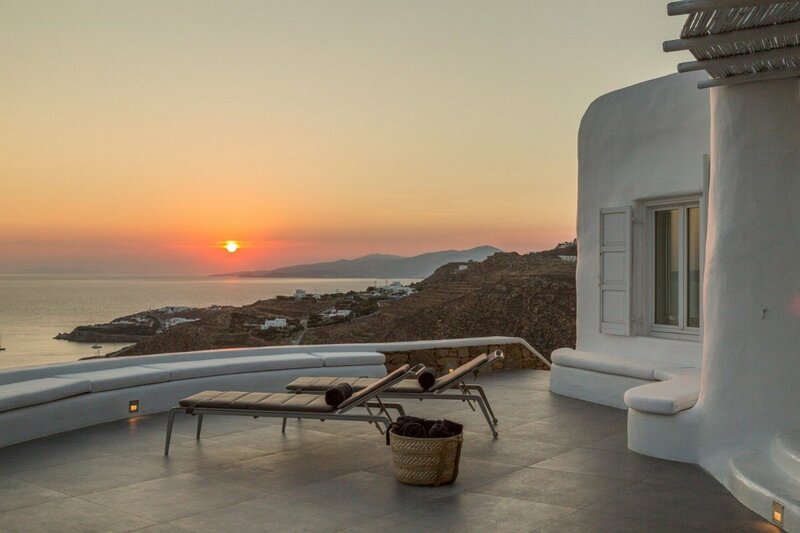 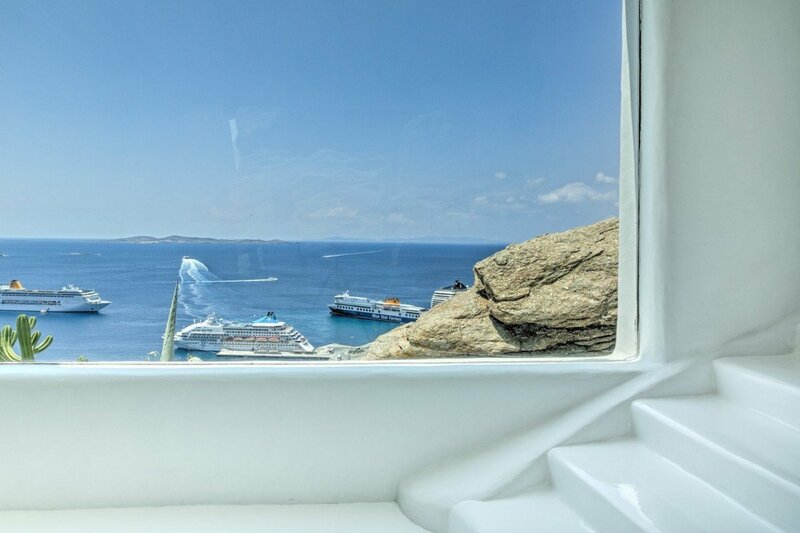 Villa Feelings, Mykonos. 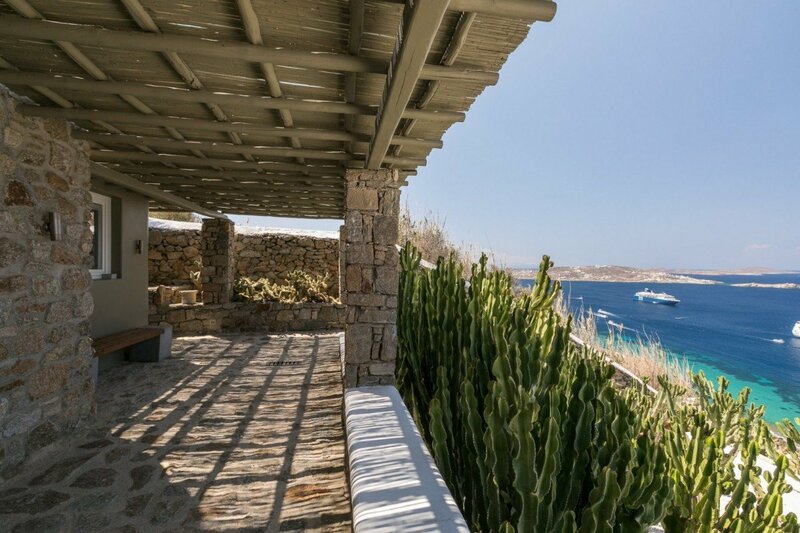 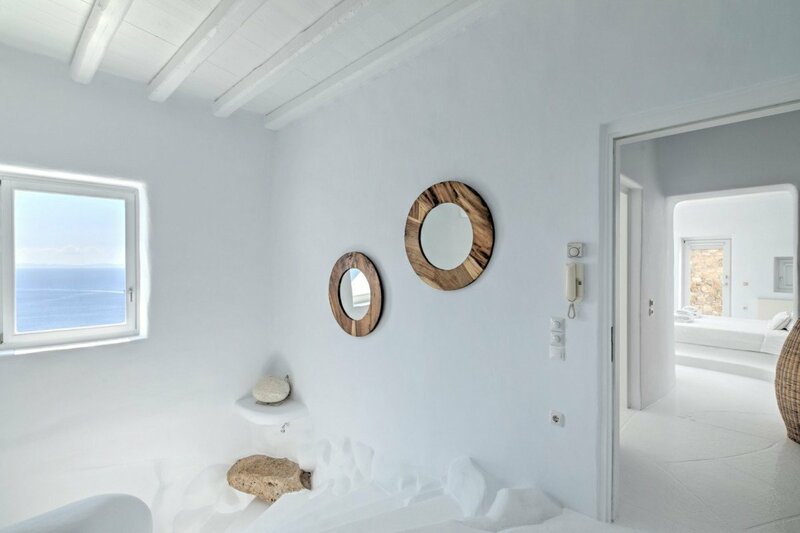 Although the Villa Feelings is situated in one of the most popular regions of Mykonos, the Agia Sophia area, it is a private and scenic retreat that offers a stunning array of indoor and outdoor living spaces to enjoy. 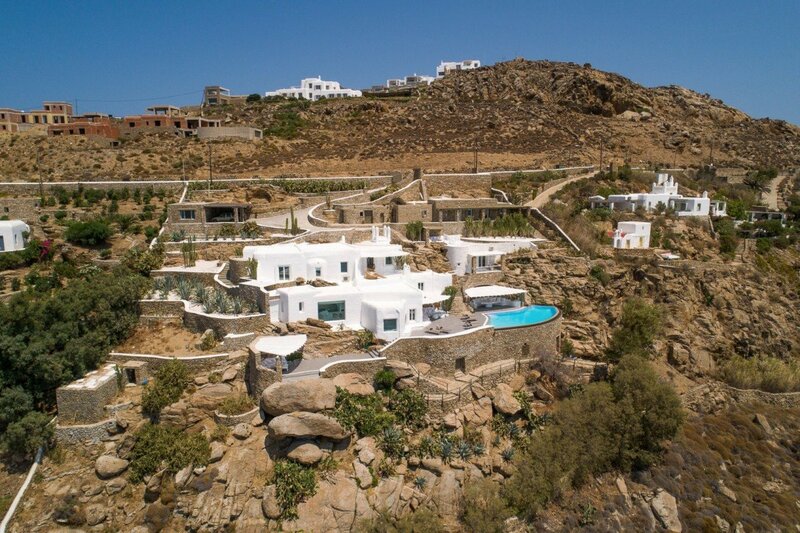 Tucked into the hillside, it is spread out over many different levels and makes the most of the show-stopping views. 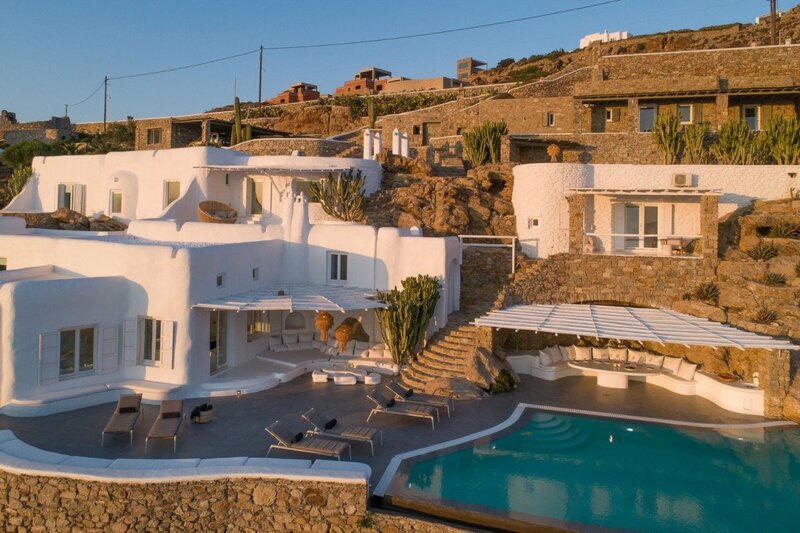 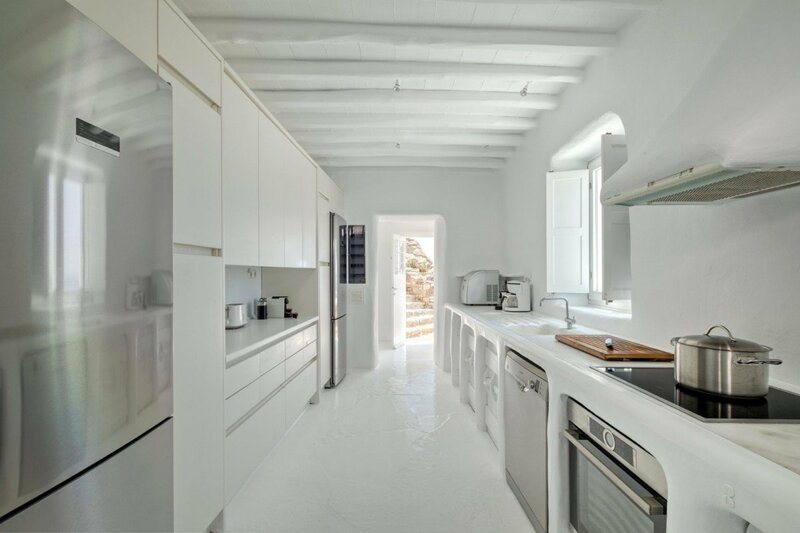 A five-bedroom masterpiece of island architecture, it can accommodate up to ten visitors easily and with ample amounts of space for all. 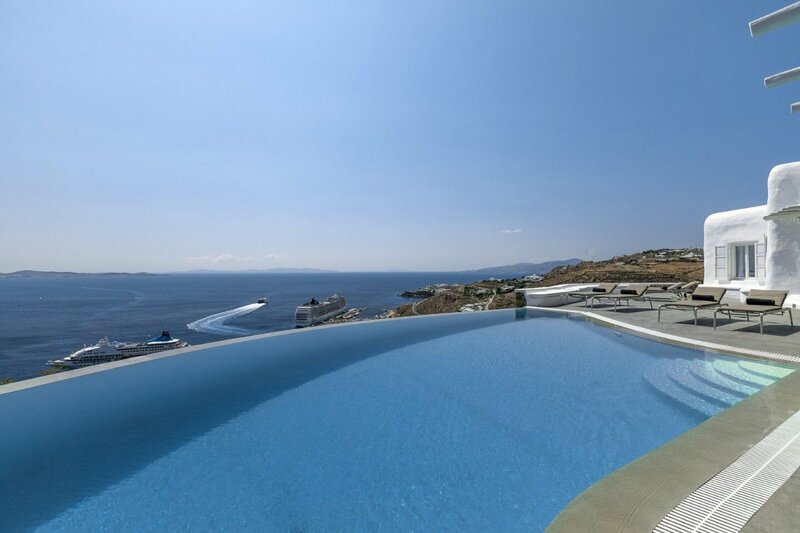 At the lower level of the villa, is the stunning pool terrace. 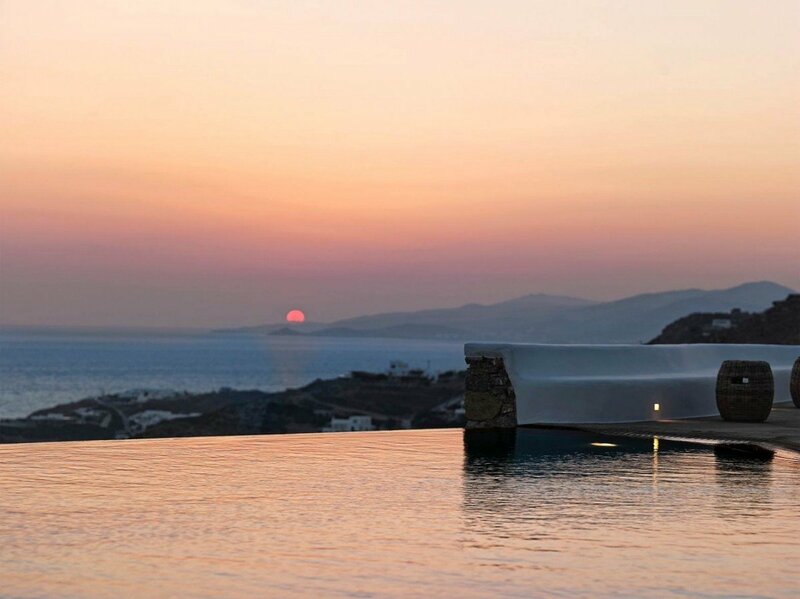 Consider this area a destination on its own for its enormous infinity edge pool and its built in verandah furnished as the ultimate outdoor space. 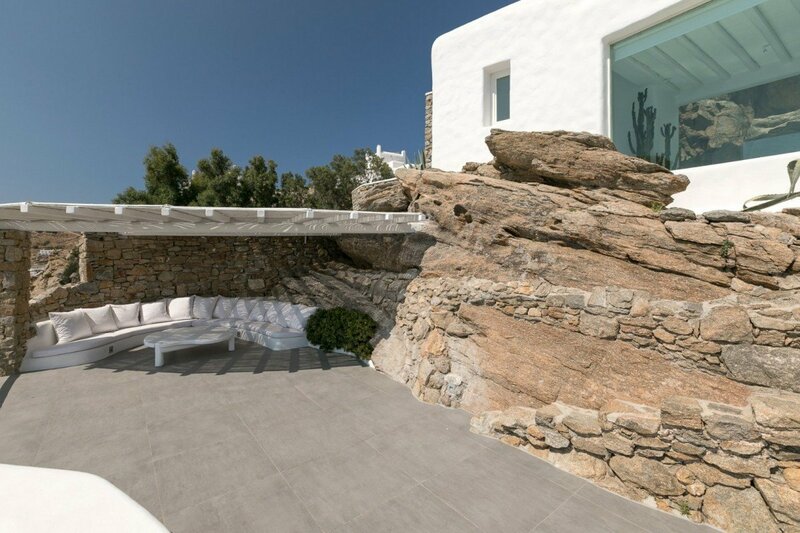 A gracefully arched banquette sofa and dining area are built into the natural curve of the native stone and provide a wonderfully sheltered spot to dine, stargaze, and lounge. 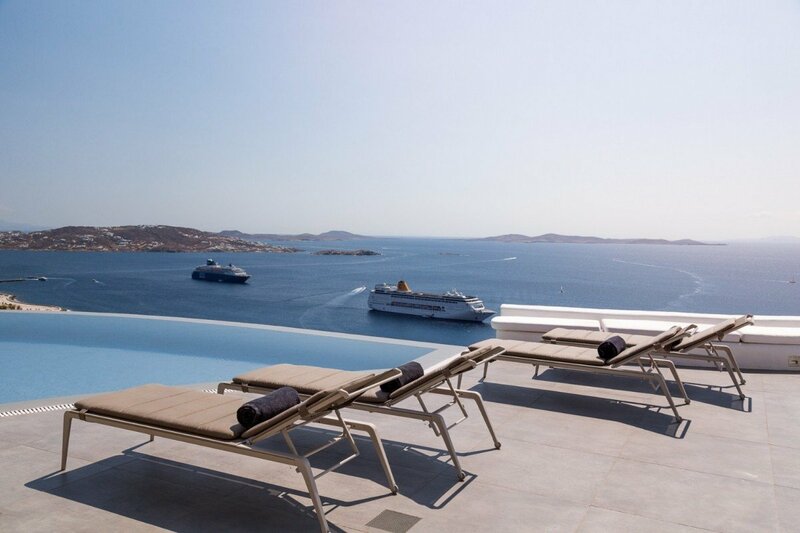 There is also a fully furnished sun deck nearby. 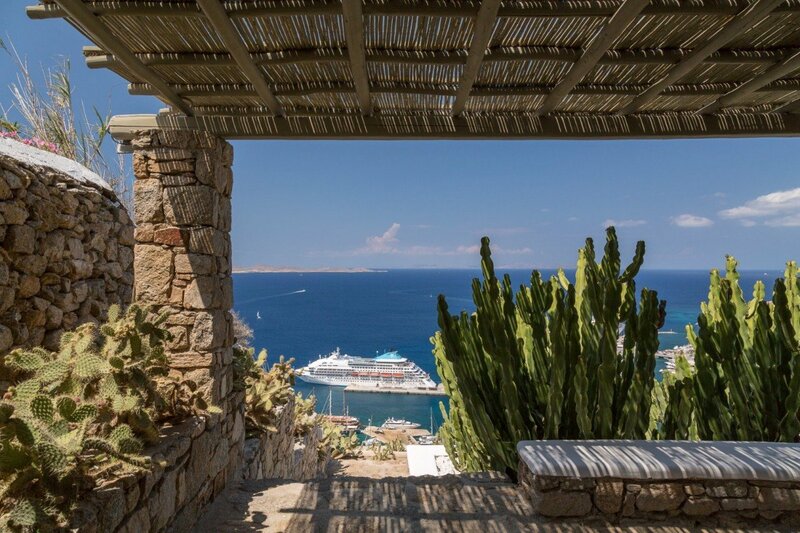 This area can be reached by elegant stone stairs from the guest house area or via the gorgeous, terrace from the main house. 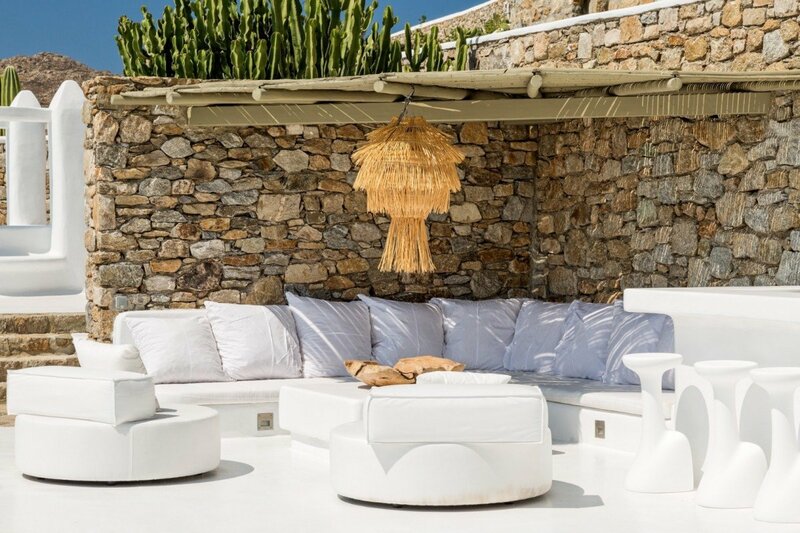 This terrace also has an oversized banquette with several chaise lounge areas and it too makes a perfect retreat full of privacy, sea breezes and sunlight. 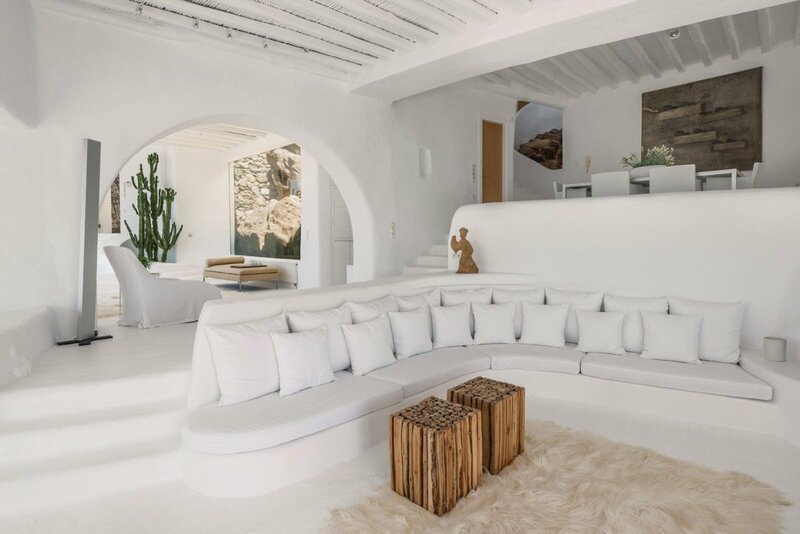 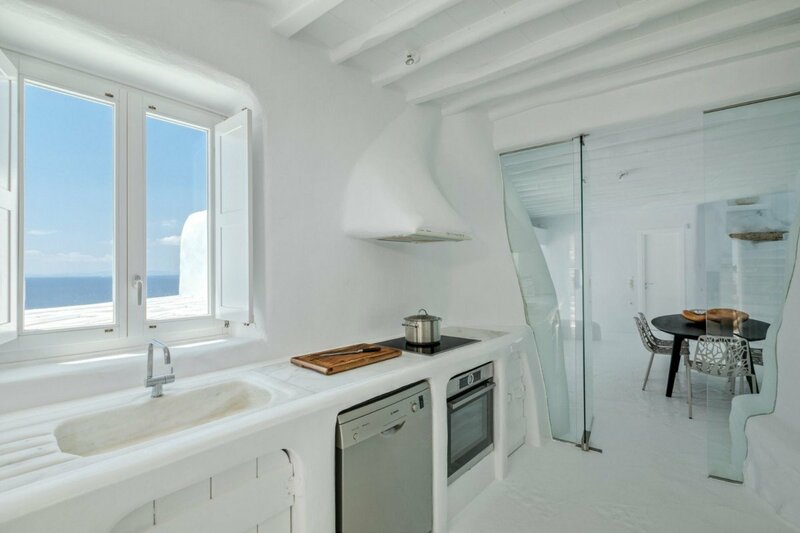 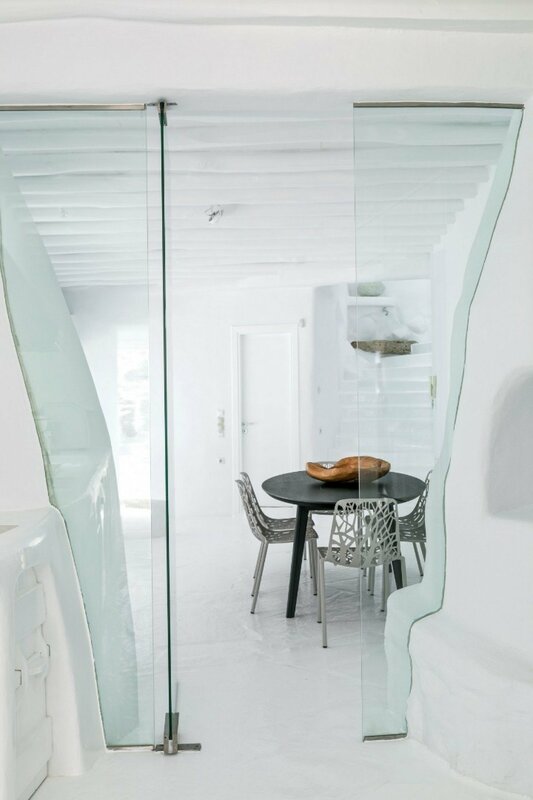 Recline or dine in style or step inside where the pure white palette and curving lines of the walls and arched doorways create a fluid and seamless setting. 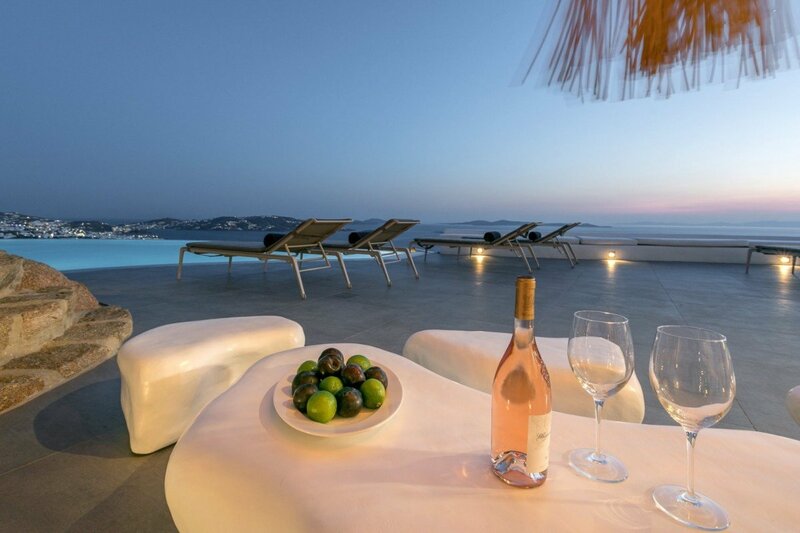 There is a large living room and sunken lounge, a formal dining room and an exquisitely designed gourmet kitchen. 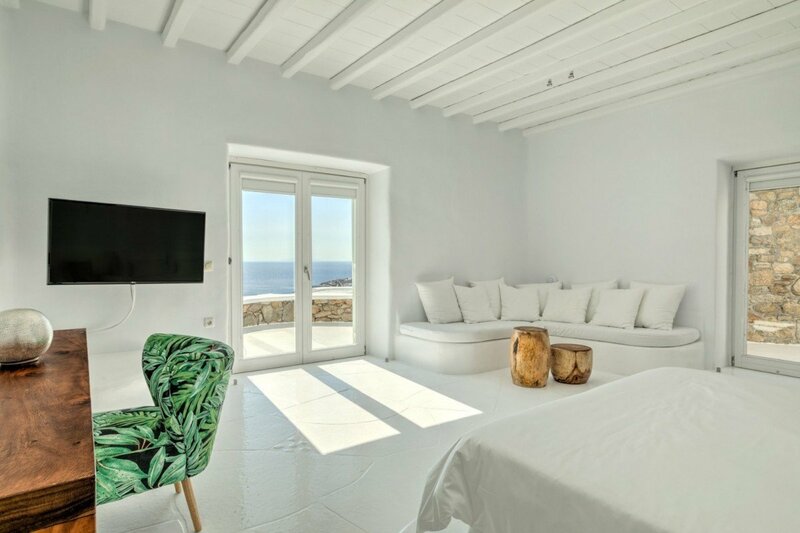 Smaller lounging spaces are tucked into surprising niches and you will never tire of exploring the property to discover its secrets. 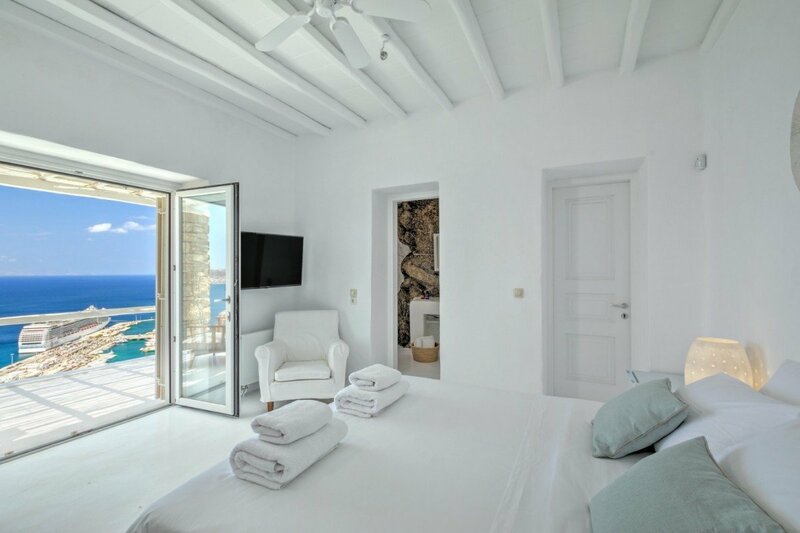 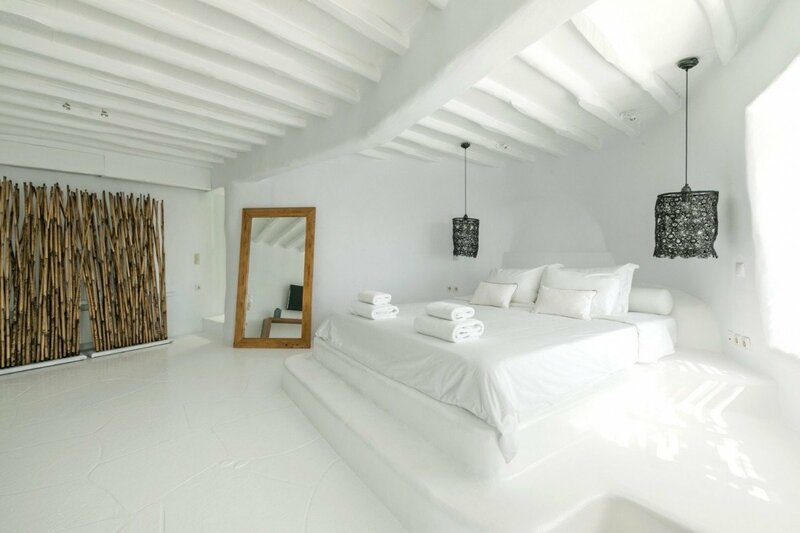 The main house has two luxurious master bedrooms with terraces and sea views, king beds and spa-like private baths. 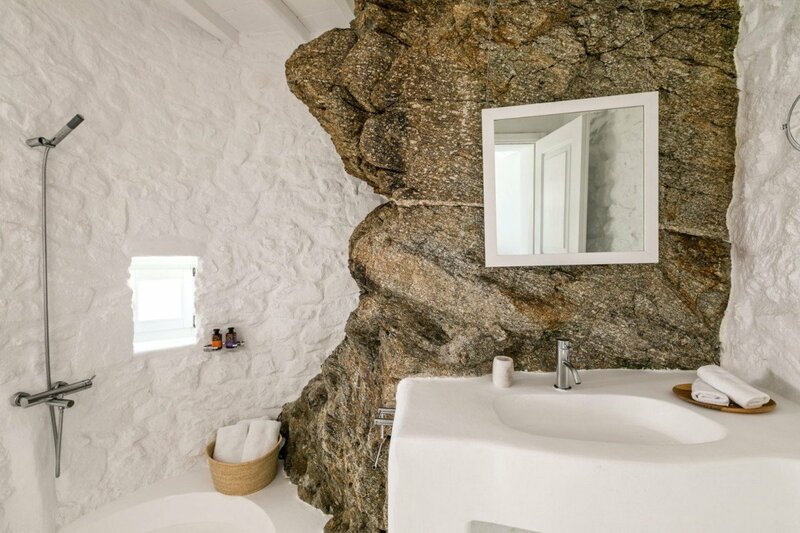 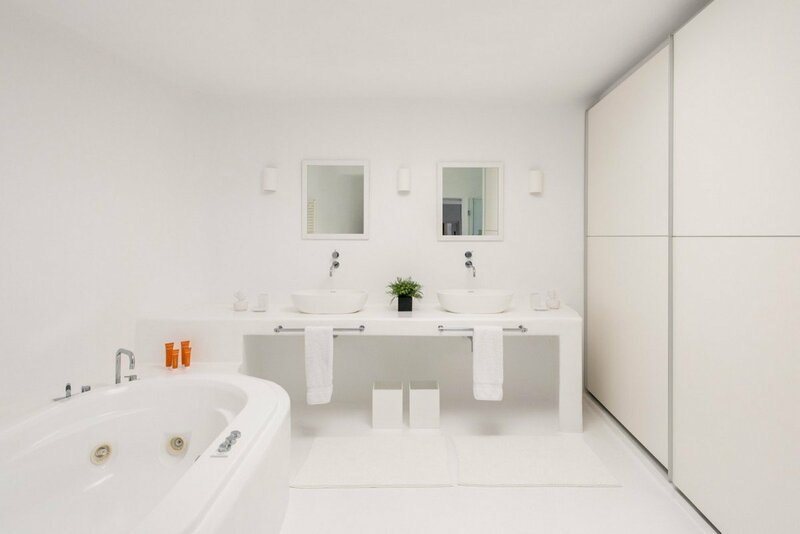 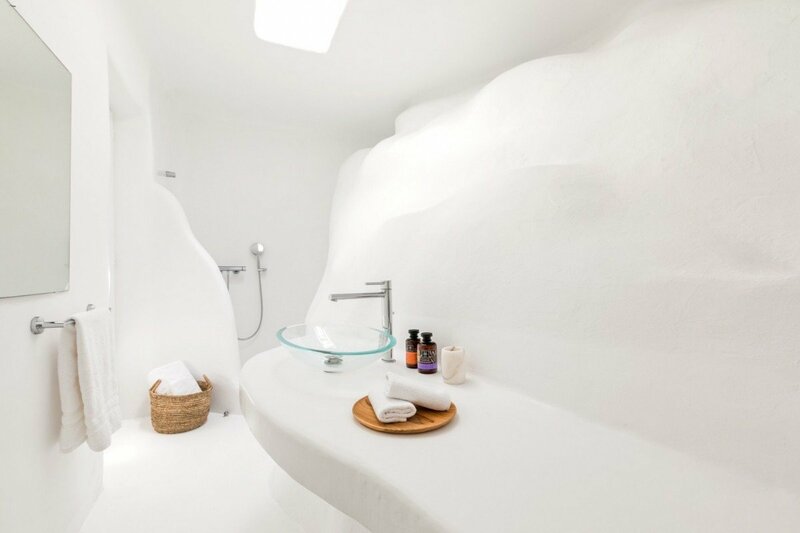 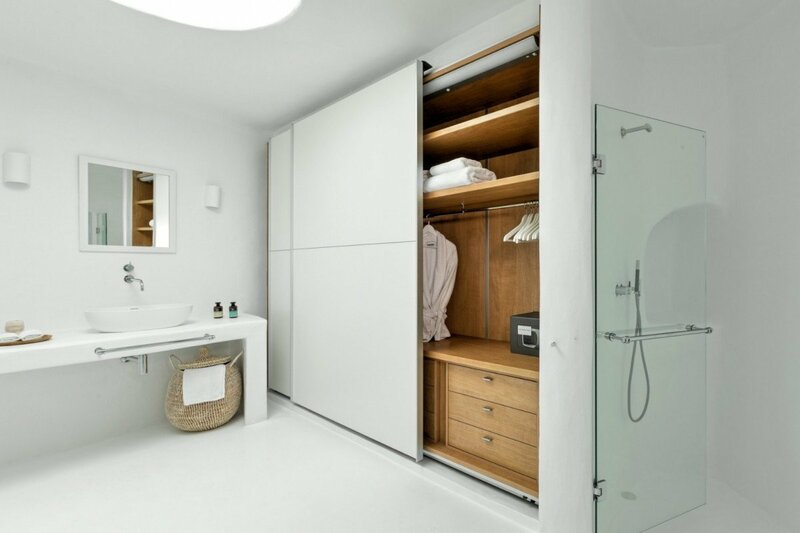 The guest house has three double suites with private baths – and all promise stunning views. 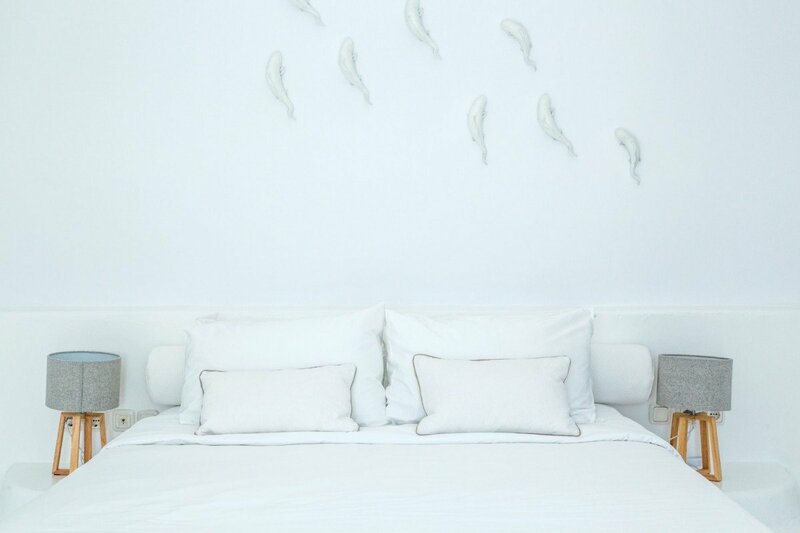 Whether with family or discerning friends, the Villa Feelings will quickly become a favorite destination.